If used properly, trackbacks and pingbacks are another way to increase traffic to your blog and build links. Why I am explaining Trackbacks and Pingbacks? Because in my next tutorials, I will show you how to Disable Self Pingbacks Without a Plugin and how to Hide Trackbacks and Pingbacks from your post´s Comments while keeping them in your Dashboard. This is how WordPress codex define trackbacks. Trackback was designed to provide a method of notification between Websites: It is a method of person A saying to person B, "This is something you may be interested in." To do that, person A sends a Trackback ping to person B. A trackback is a communication method between blogs. Trackbacks are a way to notify legacy blog systems that you have linked to them, even if you don´t have an explicit link to their article. The best way to think about trackbacks is that they are comments that you manually fill out in the WordPress dashboard. Most of the time, trackbacks are used by spammers to place a link on your Blog back to their Website. Spam Trackbacks contain unrelated comments which should never be approved. Since I don´t have the trackback URL displayed for each post on this blog. I never got a real trackback, but only spam trackbacks as you can see in the images below. Spammers submit trackbacks to your blog in the hope that a link back to their post will appear on yours. If you want to send a trackback to a blog post, you will need to locate the trackback URL provided on the blog you want to reference. Most trackback links appear at the end of the post content and before the comment´s section. Just copy and paste it into the “Send Trackbacks” field and Publish/Update your post. The image below shows, where you add the trackback URL into your post in WordPress dashboard. If you can´t see the image below in your dashboard, you need to adjust your Screen Options Settings to allow trackbacks (Tick the “Allow Trackbacks” box). If there is no trackback URL in plain view, the blog probably does not support trackbacks. Or in the case of a WordPress blog, the theme does not display trackbacks for the posts. In WordPress, you can display the trackback URL for the current post by adding the trackback_url() tag to the single.php file of your WordPress theme. The trackback_url() tag must be within the Loop. If you need more help with that, feel free to ask. Pingbacks in WordPress have evolved from trackbacks. Pingback is a special type of WordPress comment that is automatically created whenever somebody links to one of your posts from their own blog. Think about pingbacks as remote comments, done automatically by WordPress. This is what WordPress Codex say about pingbacks. This means that if you write an article on your blog and you link to an article to my WordPress blog, I will be automatically notified only if my blog is pingback-enabled. The pingback shows up in the dashboard, in my comments moderation queue. See the 2 images below for a Legitimate pingback. 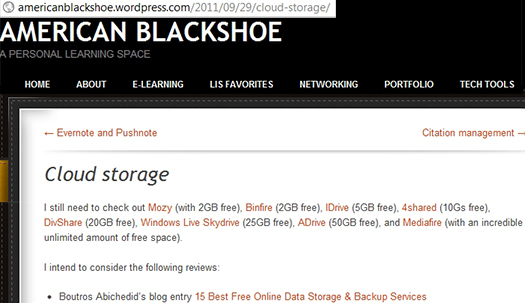 In the first image, Deirdre Black wrote a post about Cloud Storage on her AMERICAN BLACKSHOE blog and she linked to a post of mine on this Blog. Legitimate pingbacks, as the one shown above, occur when the author of a blog feels that your post is worth referencing. These pingbacks are kind of reciprocal linking. They add value to both blogs, allowing them to share readers. Some blogs are just advertisements for products that are not related to your niche. They usually have little content and large amount of outbound links aimed at increasing their inbound traffic through pingbacks. If you receive a pingback from a Blog that looks suspicious, you should delete it. Check the image below, for an example of a spam pingback. What does my 14 Tips for Maximum WordPress Performance & Speed tutorial has to do with "Weight Loss Product Crystal Meth: Maximum Speed", I guess the Maximum Speed is the common keyword for this automatic keyword harvesting. A spam blog, is a blog which promotes affiliated Websites, to increase their search engine rankings, or to simply sell links, ads or products – without publishing real content. Spam blogs provide no value and their sole purpose is to earn money. 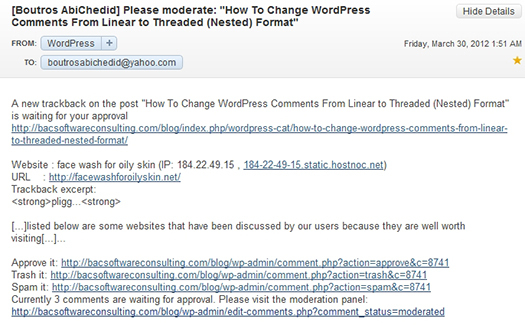 By default, WordPress automatically sends a pingback to your old post when you link to it from a newer post. It is up to you, if you allow these pingbacks to show in your Comments or not. However, in my next tutorial, I will show you how to disable self pingbacks without a plugin. Stay tuned! In WordPress, Trackbacks are filled out manually by you in the dashboard. While Pingbacks are done automatically. Pingbacks and Trackbacks use drastically different communication technologies. Pingbacks use the XML-RPC, while trackbacks use the POST (HTTP). Unlike Trackbacks, Pingbacks do not send any content. Do I get pingbacks from Forums? No, Pingbacks are specific to blogs and forums are NOT blogs. Does the other blog have to be a WordPress Blog to get a pingback? No. If you link to other types of blogs than WordPress, they will be notified automatically using pingbacks, as long as they are pingback-enabled. Do I get pingbacks from links in the Comment´s section? No, just from links in the post or page content. Does both blogs must have Pingbacks enabled? I am not sure, but I think NOT. Only the receiving blog must have pingback enabled. But, both blogs must support the Pingback protocol. From your WordPress dashboard, go to Settings -> Discussion and make sure that “Allow link notifications from other blogs (pingbacks and trackbacks)” is checked. Click on Save Changes when you are done. By doing the above, you are activating Pingbacks and Trackbacks on all your posts and pages. However, you still can disallow pingbacks and trackbacks for a specific post or a specific page. You can also handle your pingbacks and trackbacks on a post (or page) basis. This will override your Discussion Settings of pingbacks and trackbacks. For instance, to disable pingbacks and trackbacks for a specific post, go to Posts -> Add New (or you could go to an existing Post -> Edit). Scroll down and make sure that the “Allow trackbacks and pingbacks on this page” box is unchecked. If there is no check mark in that box, then that specific post will not accept trackbacks or pingbacks. You will still get self-pingbacks even if you disable the pingbacks at the Discussion level and at the Post level. These features are meant for pingbacks from external blogs. With trackbacks and pingbacks, blogs are reciprocally connected. Think of them as the equivalent of acknowledgements and references at the end of a book chapter.